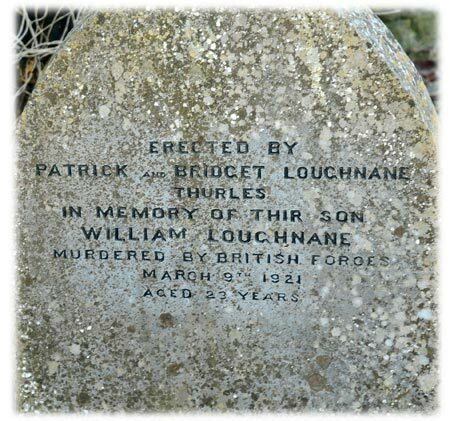 Who Shot William Loughnane In Thurles On March 9th 1921? Who shot 23-year-old William Loughnane at his home in Mitchel Street, Thurles on this month 96 years ago; March 9th 1921? Some newspapers printed the story as part of the other happenings of this time around the country, as shown hereunder. The story had been released, through Thurles R.I.C. and Black and Tans soldiers, that Loughnane had been shot by the close friends of ex-British soldiers James Maher (“Rockam”) and Patrick Meara (“Swordy”). Both these latter named were suspected as being spies by the Thurles IRA volunteers and were executed on the orders of James Leahy, Commandant, No. 2 Mid-Tipp-Brigade. Indeed, the facts are given by James Leahy; same written hereunder and contained in a Bureau of Military History statement made in relation to Irish Volunteers, Irish Republican Brotherhood and Sinn Féin activities here in Thurles, Co. Tipperary and relating to the years 1914-1921. “In the last days of February 1921, one of the Thurles I.R.A. companies were drilling at Loughtagalla on the outskirts of the town when several lorries of police attempted to surround them. There were about 6o Volunteers on parade but they all managed to get away safely. One young Volunteer, Thomas Kelly, Mitchell St., who was running to warn his comrades of the approach of the lorries, was fired at by the police and shot dead. Following that shooting incident, things became very lively around Thurles for a while. Two natives of the town and both ex-British soldiers James Maher (“Rockam”) and Patrick Meara (“Swordy”) had been under observation by the Volunteers. Both men were intimate pals and had been mixing a great deal with the R.I.C. and Black and Tans. They had been seen, too be hanging around country roads in the vicinity of houses where “wanted” men were fed and sheltered. “I cannot say now whether it was the arrest of Jerry Ryan or the shooting of Tommy Kelly that led the Battalion Council of the 1st Battalion to ask for permission to execute as spies Maher and Meara. I gave authority for their execution. It may have been on 1st March 1921, that the two of them, while sitting on Turtulla Bridge, were captured by Mick Small and members of the brigade column. They were taken across the fields to Ballytarsna (Some 8 miles (13 km) by road, South East of Thurles) where they were informed by Small that they were about to be shot as spies and if they wished to have spiritual attention it would be forthcoming. Meara did not answer, but Maher became very abusive. Both men were then told to go on their knees and say their prayers. Neither of them did so, and Small then ordered the firing party to proceed with the execution. From what I was told afterwards, Meara was silent as he faced the firing squad. The usual notices were pinned to the bodies or both men announcing that they had been executed as spies by the I.R.A. Reprisals for those executions took place on the night of 10th March 1921. Five masked and armed policemen raided the house of Larry Hickey, Publican, Main St., Thurles, when they found the owner in bed. He was ordered out in his night attire and when he reached the head of the stairs he was tripped and thrown downstairs by an R.I.C. man named Jackson. In the fall, Hickey’s neck was broken and he was in great pain at the foot of the stairs when Sergeant Enright, who was in charge of the raiders, shot him dead, to put an end to his agony. Hickey was a well known republican in Thurles, and a detailed account of his shooting was given to me during the Truce period by Sergeant Enright himself. While the raid in Hickey’s was in progress, another party of masked policemen visited the home of the Loughnane family in Mitchell St., Thurles, and shot dead in bed William Loughnane. This man along with his father and three brothers were active members of the local I.R.A. company. Two politicians, Mr. T. Griffiths (1867–1955) and J. Galbraith (1872–1945), on separate days (13th April 1921 & 14th April 1921) asked in the British Parliament as to the result of the official inquiry into the murders of William Loughnane and Laurence Hickey and the attempted murder, on the same occasion, of men named Regan, Griffin, Leahy, and Lupton, all of Thurles. Their questions were addressed to the former Solicitor General, and later Attorney General and Chief Secretary for Ireland (July 1919) and soon to be first Lord Chief Justice of Northern Ireland (1921 to 1925) Mr. Denis Stanislaus Henry. In Parliament, and while living under the constant threat of death at the hands of IRA assassins, it was Mr Henry’s lot to defend and explain government policy during the Anglo-Irish War of 1919-1921, as Ireland and Tipperary continued its spiral into anarchy and chaos. The reply in parliament by Mr Henry, on both occasions, regarding the findings of the Military Court of Inquiry, in lieu of inquest into the deaths of Laurence Hickey and William Loughnane, was that they were wilfully murdered by persons unknown. The police have up to the present been unable to obtain any evidence leading to the identification of the person by whom these murders were committed or of the persons by whom the houses of the other persons mentioned in the question were raided on the same night. It must be remembered that the ‘Restoration of Order in Ireland Act 1920’ was passed on August 9th 1920 in an attempt to address the collapse of the British civilian administration in Ireland. This Act also provided for the replacement of ‘trial by jury by courts-martial’ in those areas where IRA activity was most prevalent. Military courts were now to be substituted for coroners inquests, since local authorities had begun finding British soldiers liable for the deaths of Irish civilians.